Madeira applique is a well loved technique in heirloom sewing. It is one of my personal favorites. 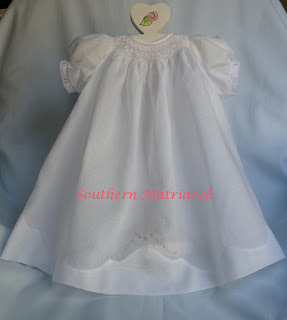 I am all for frothy heirloom for special occasions such as First Communion, baptisms or flower girls; other than that my tastes run pretty tailored. Madeira is perfect for that. It is dressy without being fussy. With Easter on the horizon, it is a perfect time to think about Madeira applique. 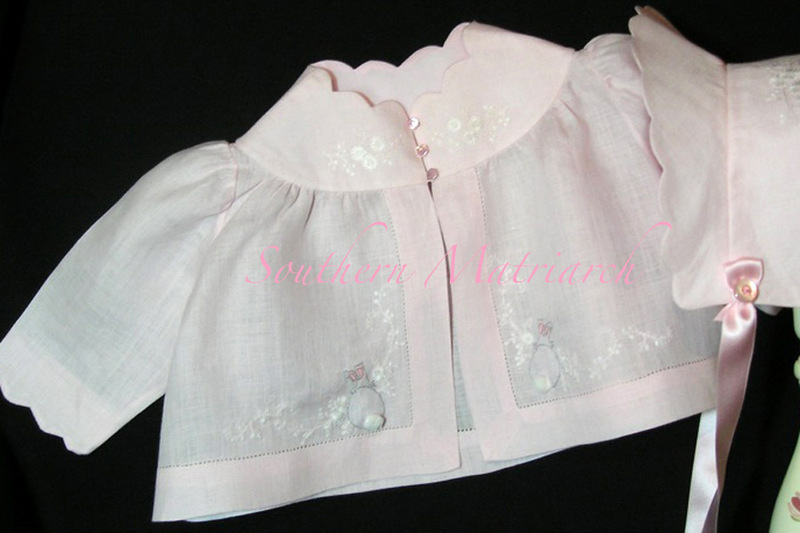 This is a Wee Care gown I entered in the fair. This example of the applique is white on white. A sweet baby bonnet from a couple of years ago. This is the collar of an Easter dress I did for my youngest daughter about seventeen years ago. It was from an issue of Creative Needle magazine. This was probably the last Easter dress I made for her. 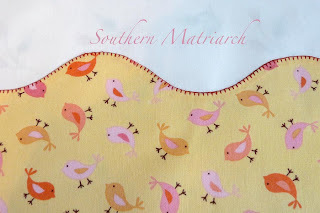 Madeira applique doesn't have to be shaped. Here it is a straight hem on a little jacket posted here. 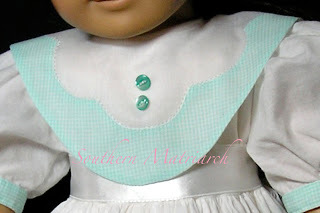 I was asked several weeks ago to do a tutorial on Madeira applique, I apologize for taking so long to get this posted. Life, what can I say? 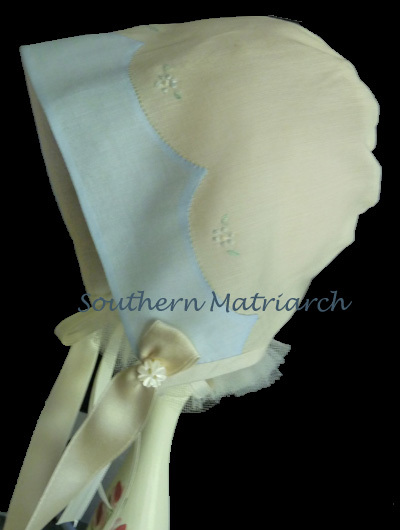 Madeira applique can be shaped or straight. It works best with natural fiber fabrics. It can be accomplished with poly/cotton but it can be a bit trickier. And as always, lots of pressing and starch! A word about sharp needles: For some reason years ago, we got hoodwinked into thinking "Universal" needles were the thing, they are not. Universal needles are a modified ball point needle better suited for knits. 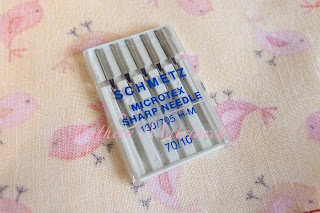 With woven fabrics you will have better results with a sharp needle. It will pierce the fabric thus resulting in a straighter seam with less puckers. Natural fiber fabrics; Madeira applique is best achieved when the fabric is able to make a crisp fold. Natural fibers will behave better for this than poly/cotton. Polyester has a memory like an elephant. It likes to return back to where it came from, so it always has a little "spring" to it, making it a challenge to get a crisp fold with it. That is why polyester requires little ironing. So let's get started. There are lots and lots of pictures. As always, you can click on the picture to enlarge it. I chose two scraps out of the closet, a white cotton and a printed cotton. I chose the print because you can see the right and wrong side are different. Important note, it is very important that you cut your pieces and trace your design with the straight of the grain. If you just slap dash your pieces you will get puckers. Not what you are aiming for. Madeira is a crisp tailored application. Grain is important. Either tear your pieces or pull a thread and cut to make sure you are on the straight of grain. I chose to demonstrate a curved applique because that is more challenging, if you can do a shaped applique, a straight one will be a breeze. Here I have traced with blue wash out marker both a 1/4" registration mark and my shaped FOLD line. The registration mark is simply so I have my design straight on the grain of the fabric. See note above about grain. Many patterns will have you cut out the piece to be appliqued along a cutting line, I have traced it on the fold line and NOT cut it out. It is more stable and less likely to be stretched out of shape. 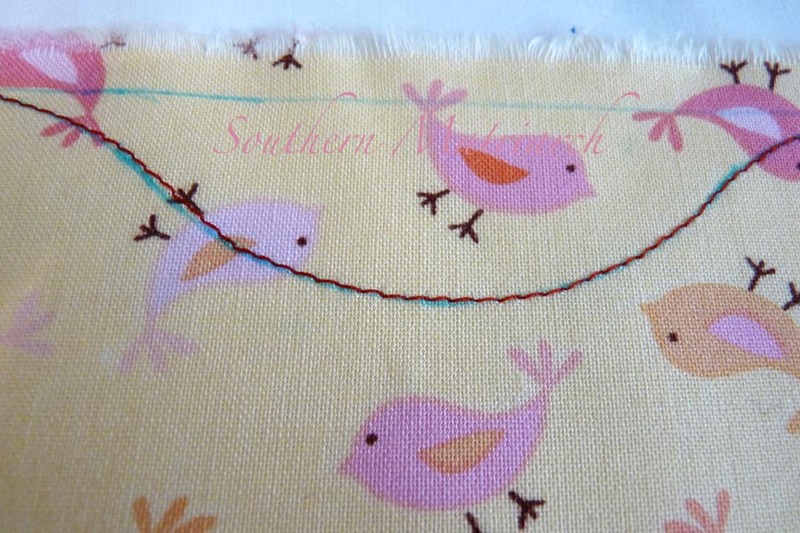 Next, I have stitched a cheater line along my fold line. I chose a contrasting color for demo purposes. 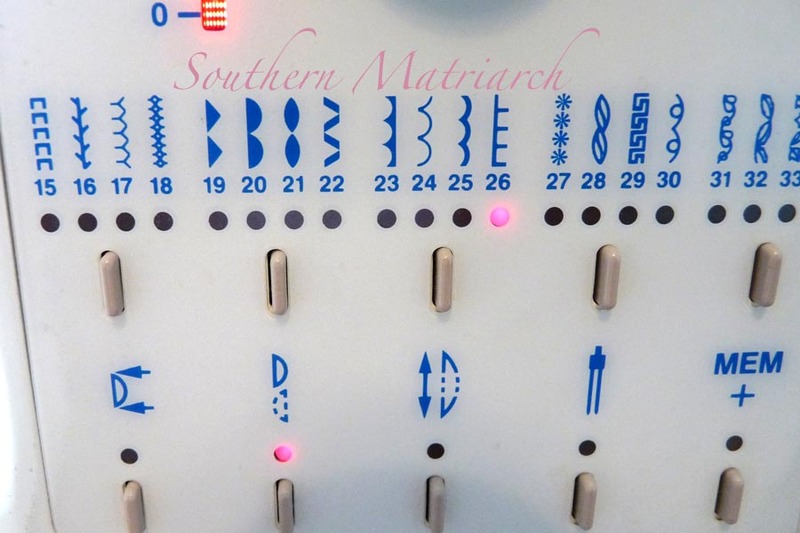 If your machine has a "needle down" feature this is a great time to use it. It will help you pivot along your design line. You can see that I missed my blue line for a teeny bit there. Since the line is still a nice curve, I left it. If I had jagged off the line, or wildly missed it, I would have taken it out and restitched. NOW cut out 1/8" to 1/4" inch away from your cheater stitch. 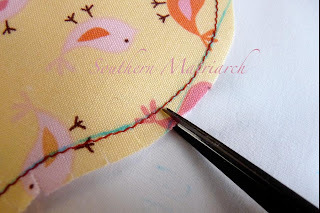 If you don't think you can cut an even seam allowance, run a second cheater stitch on your machine 1/8" to 1/4" away from the first, then cut just inside that stitch to get a nice even seam allowance to turn under. 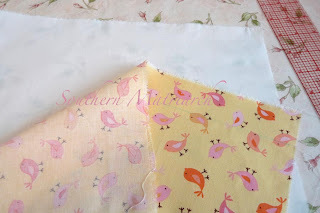 The reason an even seam allowance is important is often with this technique you are using more sheer fabrics. The seam allowance will shadow through to some extent. You will notice it less if it is small, even and tidy. Now to the part that seems to be the trickiest for many people. Notice that I have written on the white base fabric in blue marker, "wrong" and "right", this is important. 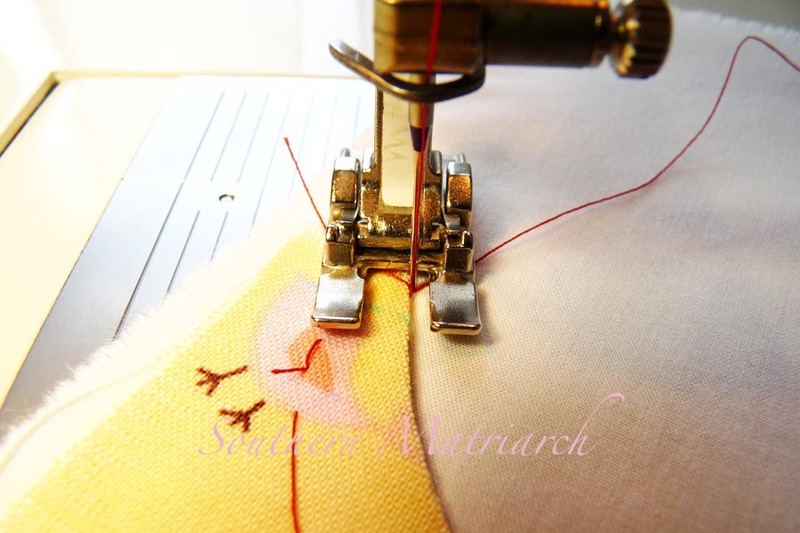 You are going to stitch your applique piece onto the wrong side of your base fabric initially and then turn it to the right side. 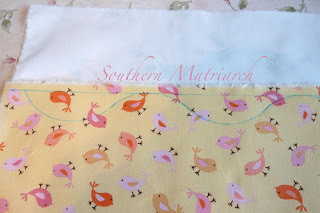 So lay your RIGHT side of your applique down to the WRONG side of your base fabric. Matching your raw edges. 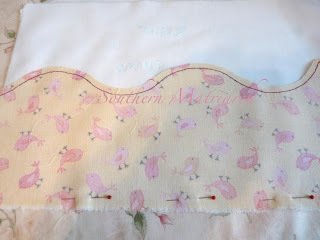 If you don't trust yourself, pin a seam into the pieces and flip them over to check that your right side of the applique ends up on the right side of the base fabric. Stitch your seam. I have used a 1/4" seam allowance. Press that seam as it was sewn. 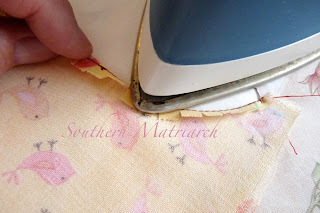 Open it flat and press your seam allowance to one side. Press from both the wrong side and the right side. 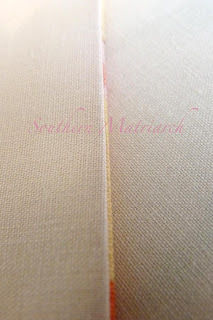 You want that seam pressed well so that when you turn it, your get a crisp edge. Fold your applique to the front, finger press along the edge or roll it between your fingers to get that seam to the edge of your fold. If not, your applique will not be even and will ripple. Press on the wrong side to push the base fabric away from the edge so that ONLY a thread or two of your applique fabric rolls to the back. This is a TEENY amount so that you don't see your base fabric from the front at the edge of your hem or collar. 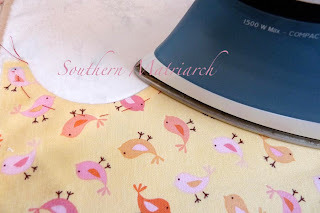 This is more important when your applique is a contrasting fabric as this one is. 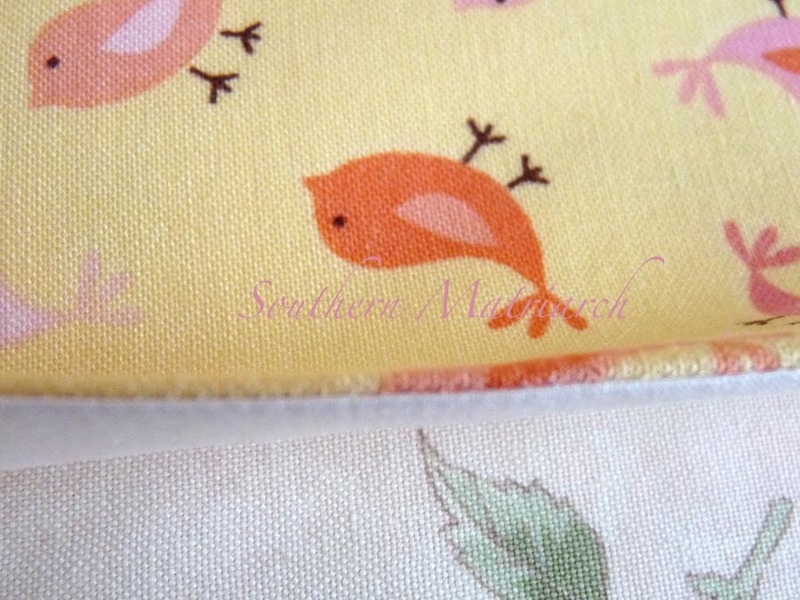 Now you are ready to clip the seam allowance of your applique before you stitch it to your base fabric. Clip right up to but not into your cheater stitch. I have clipped every 1/8" to 3/16". The more clips, the smoother your curves. 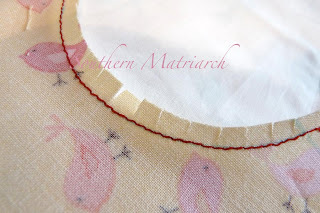 If you are doing a straight applique hem, no clipping is necessary. 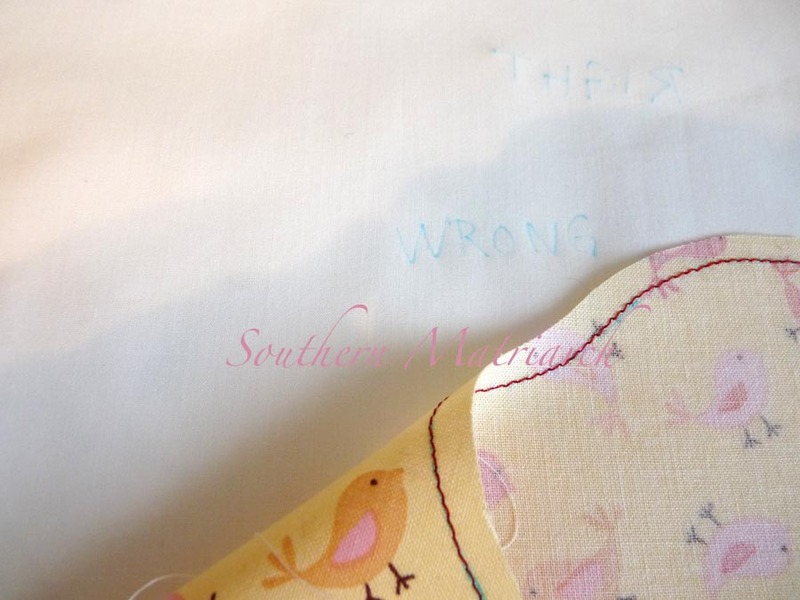 Press your applique seam allowance to the wrong side. Here is where that cheater stitch comes in so handy. 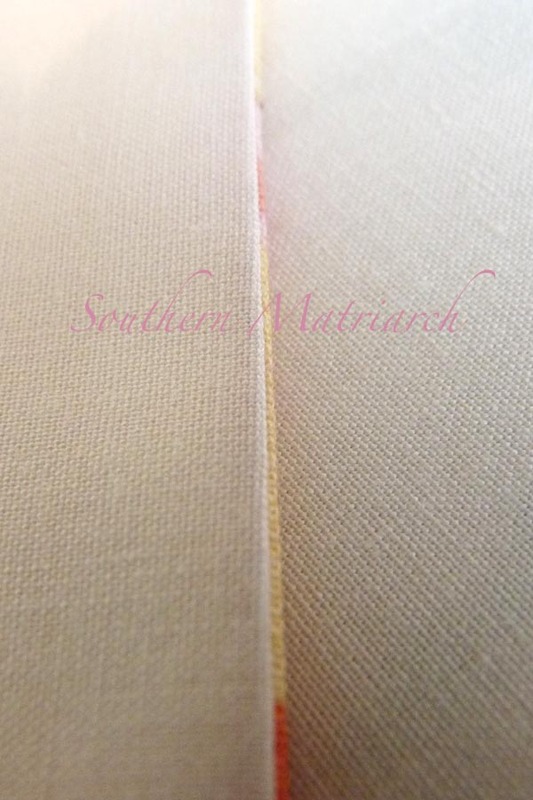 You can put a tiny bit of tension on that cheater stitch and it will help roll that seam allowance to the wrong side right along that line, giving your a nice clean curved fold. This works best on the concave curves but it also is beneficial on the convex curves. (See girls, I told you geometry was important in high school.) Continue pressing along the cheater stitch across your applique piece. Press again from the right side, this time using a mist of starch. I know I press a LOT, it helps just as much as I press, a LOT. The starch will help "glue" your applique in place. Smooth your applique piece with your hand, pin along the bottom at the fold. Pin again, evenly, closer to the turned under edge. Now comes the step everyone wants to skip. BASTING. You are going to baste along the edge to be stitched down pretty close to the edge. I hear you whining,"I have three, size 6, flower girl dresses to do; I don't have time to baste!" One question; do you have time to take it out and re-do it? I didn't think so. This step will give you better results and save you time in the long haul. By using pins along that fold line, you will be more likely to get pinches, puckers and peaks along that curve. Again, not the look you are after. So baste that edge. Remove your pins along the bottom and below your edge. Yes, press it again. My applique, attached at the edge, seam allowance turned under, basted and pressed. Ready to stitch it down. You can stitch it down in several ways, you can edge stitch it with a straight stitch or you can stitch it with a hand or machine pin stitch. You could also stitch it down with a blanket stitch by hand. Today I used a machine pin stitch. 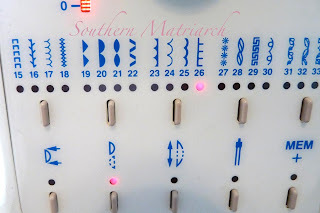 On my machine, the pin stitch, #26 is the one that looks like a one legged ladder. I have mirror imaged the stitch so that the leg of the ladder will be outside of my applique and the rungs will swing over and catch my applique. I have used an open toe foot so I can see better. Again if you have a needle down function on your machine it is helpful for this. Go slowly, making sure that the ladder leg stays just off the contrasting fabric. Pivot as you follow the curves, making sure to pivot while your needle is sunk into the base fabric, not the applique. My completed applique. 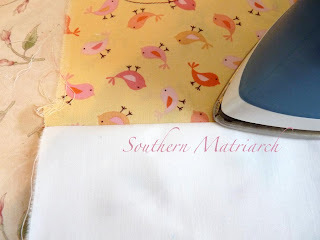 Normally for a dressy look, I would match the color of the thread to the applique fabric, for a more casual look you can use a contrasting thread. I have done so here so you could see. 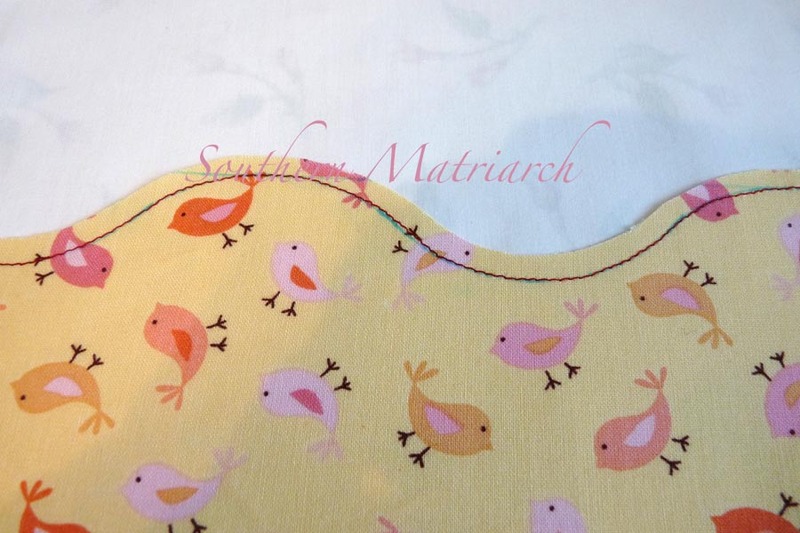 Like I said, if you can do a curved applique, a straight one will be easy peasy. An extra tip, I sometimes use Wash A Way thread for my cheater stitch and hand basting. When it is complete, I just spritz it with water and it is gone. Another hint, if you want the look of a hand pin stitch but the even nature of a machine pin stitch, use the Wash A Way thread for the machine pin stitch first. Come back and stitch it by hand with floss or floche, stitching right in the same holes. 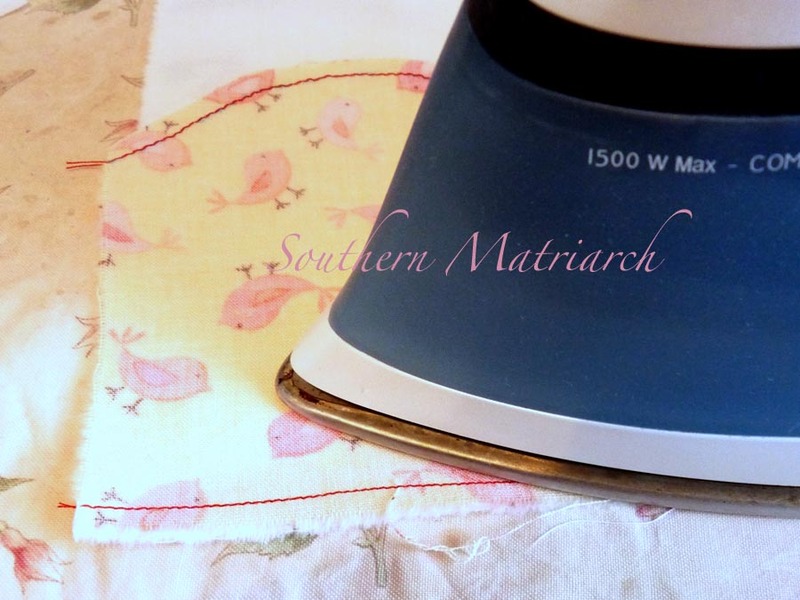 When you spritz away your Wash A Way thread, you have gorgeous, perfect pin stitching by hand. 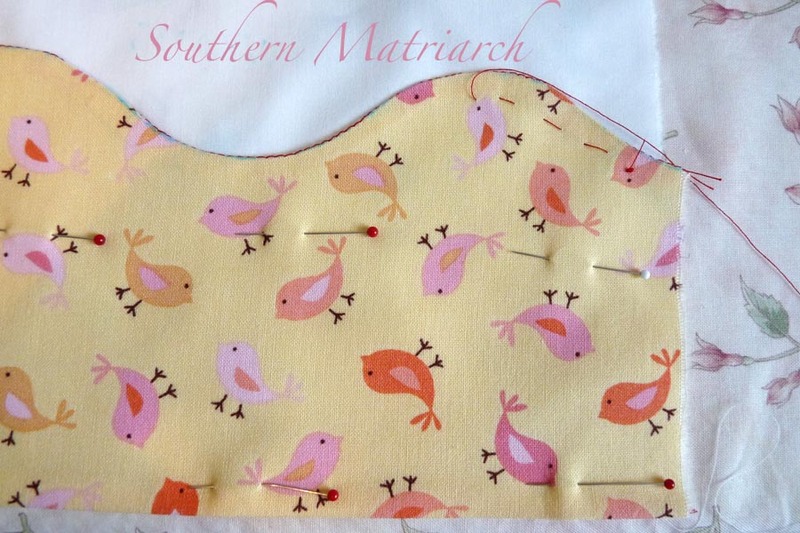 Boy will your sewing friends be impressed! Practice Madeira applique a few times with regular thread before trying this alternative trick. And no, contrary to legend, I did not make a bathing suit for my daughter using wash a way thread! I hope this helps and I can't wait to see what you do with it. Great tutorial! Madeira applique is time consuming, but I do like it's tailored look. Thanks for posting! Marvelous tutorial, as always! 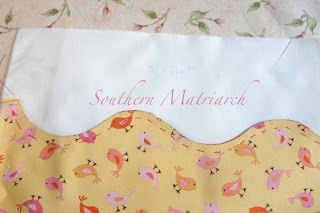 I expect to see lots of sweet frocks with madeira appearing across blogland this Spring! I love Madeira applique. 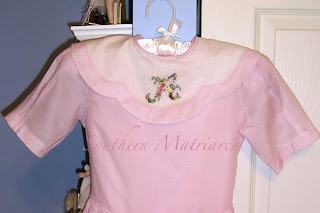 I've used it several times on Easter dresses for my grands. It's time to start thinking about Easter clothing again, now that I have 7 grands to sew for!!!! Thank you so much for doing this tutorial. It will help me alot. Many people assume everyone owns an electronic machine, I don't. So again thanks for other ways of finishing other than the machine pin stitch. Thanks for this great tute! I've been wanting to do this for a hem treatment. Love your tips too. And the birdy print is too cute! As always, your instructions and photos are very simple to understand and very graphic. I will now try my luck at this technique with a better understanding. Also, your needle primer was great! I will now start using my sharps! 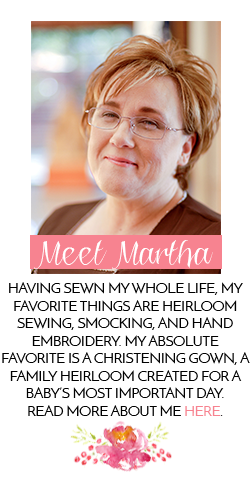 Great tute, Martha. You are doing us all such a great service. Excellent tutorial as usual! I love lots of pictures. Being a pretty visual learner, I need to be able to see what it should look like. Thanks so much! Excellent tutorial - love all the pictures and detailed instruction! Thanks for the great pics and instructions! I've got to try it now! A terrific tutorial!! Thank you! A really practical tutorial that definitely demystifies this seems to hard to bother with technique! Thanks. i know i'm a little late to be commenting on this post...but i've only recently found your blog and am getting through all the posts. 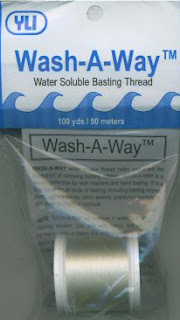 I've now ordered my wash-away thread and am looking forward to giving this a go. Thanks! Any tips on doing the Maderia with points? I have just found your site, and I am so glad I did! Your tutorials are marvelous! wow, so many things for me to learn in this tutorial. Thank you. I love tailored little girl dresses. 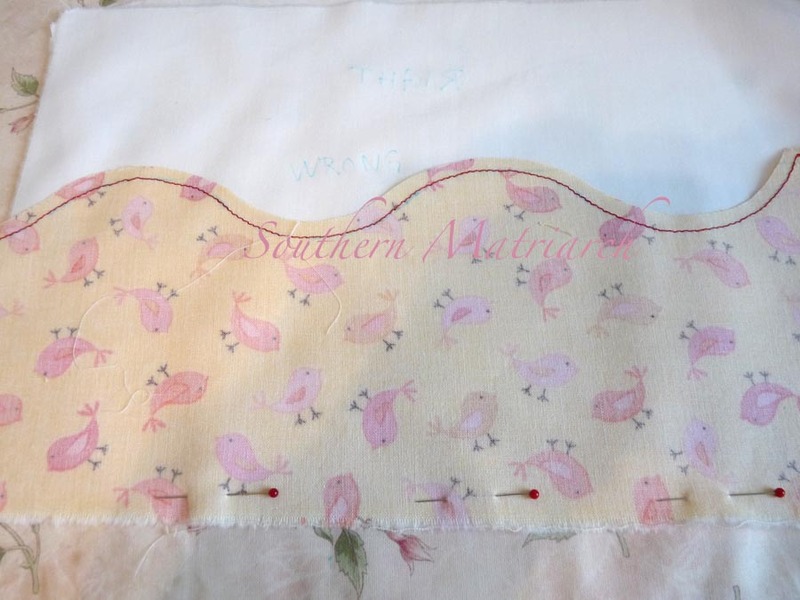 When reading and looking at the photos I got a bit confused; "Press your applique seam allowance to the wrong side." Looks like the contrast fabric is sewn to something? Karel, the contrast fabric is sewn to the base fabric. First right side to the wrong side, then turned to the right side of the base fabric. I had used a "cheater" stitch to mark my hem allowance on the contrast fabric. I then turned that hem allowance to the wrong side following the cheater stitch before I pin stitched the contrast fabric down on the right side. I hope that answers your question. If not let me know. Thank you for this! It was easy to follow and answered quite a few questions I had, since most of the on-line tutorials are only vague "hints" because the originator wants you to sign up for their highly-priced full length videos. Here! Here! Yes, I'm here!